Are you a Hillary Clinton fan at the end of your rope as this election season nears its final day? Have you spent months on Facebook unfollowing your Trump-supporting relatives and unfriending all of your high school acquaintances who use #MAGA in earnest? It's proven that this election cycle has been bad for everyone's mental health, but for Clinton supporters, there is a glimmer of hope to be found on social media, where there was once only despair, in the form of Pantsuit Nation, a secret Facebook group whose rapid gains in membership and prioritization of positivity in the name of a future Madam President have been gaining media attention since the weekend. Though state-specific imitation groups have been popping up across Facebook, don't be fooled. The original Pantsuit Nation is a secret (now, in name only) group, and the only way to get in is to be invited by a current member. But considering its membership is now over the 1.8 million mark, chatting up your online Clinton-supporting friends could very well win you a coveted invite. But before you go begging your way through your friends list, here are the basics on the most talked-about secret Facebook group of the 2016 presidential election. Pantsuit Nation is a Facebook group for Clinton supporters. Mashable reports that 33-year-old Libby Chamberlain started the group in late October, after watching Donald Trump call the pantsuit-clad Clinton a "nasty woman" in the final presidential debate. She started the group the next day to encourage her friends to show their support for Clinton by wearing pantsuits on Election Day. Chamberlain's call for Clinton fans to pantsuit up has now become national news, with even Beyoncé getting in on the trend. 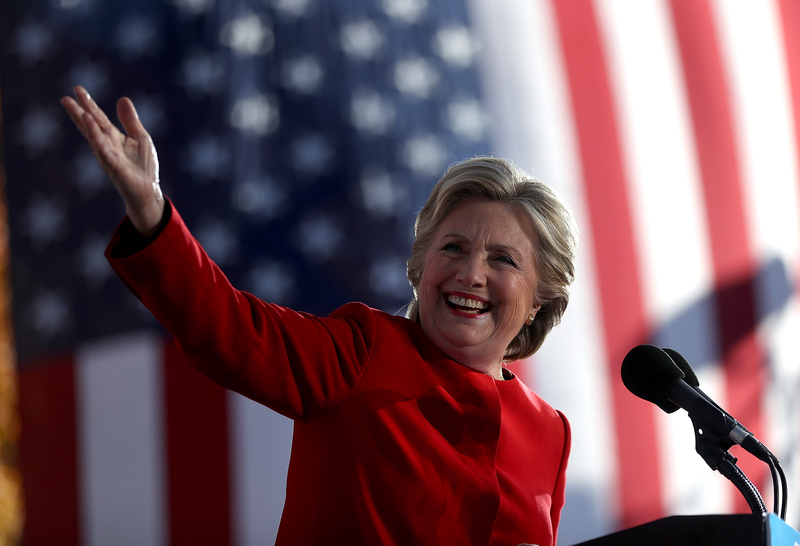 It only took Pantsuit Nation a couple weeks to break a million members, and in response to its wild popularity, the online group has expanded with its own public Facebook page, website, and Twitter account. Why Would I Want To Be Involved? This election season has weighed heavily on all Americans. But for women, the sexism and misogyny that have come along with the prospect of the first woman president have been particularly jarring. Pantsuit Nation is meant to be a safe space for fans of Clinton to not only unapologetically espouse their support for her, but to also share heartfelt remembrances of the feminists who inspire them, commiserate about fights with Trump-supporting relatives, and celebrate casting their votes for the woman they hope will become president. Several Pantsuit Nation members have remarked on the group's almost therapeutic function in tweets of joy and relief. Pantsuit Nation is a secret Facebook group, and as such, a current member has to invite you to join before you can accept the invite or even see it come up in a search. This process may sound frustrating, but has served to prevent multitudes of trolls from flooding the group and its timeline. But if you want to join and are not deterred by having to ask around, make it known to all of your Clinton-loving, Facebook-frequenting friends through DMs or a text. If you're not worried about making your love for Clinton public, put out an open call for an invite on Facebook or Twitter using #pantsuitnation. And while you're waiting for your membership to be accepted, join the conversation by following @PantsuitNation on Twitter or on Instagram, where the group will be spending Election Day posting all of their favorite pantsuit photos. No matter what you do, if you're an aspiring Pantsuit Nation member, be sure to honor the online group's mission IRL by wearing your most confidence-inspiring pantsuit on Nov. 8 while casting your ballot.